A few months ago, I posted some pictures of Special Things that Scott and I chose to keep when we moved to the US from Scotland. I promised a Part 2 of some other special things we kept. I've been waiting until I got a few of these things framed (the tea towels) before posting, but this weekend I went on a bit of a frame splurge and got them up. Now I just need to get frames for our family portraits, and I'll be just about done! So first, the tea towels. Technically, only the first one (the blue one) came over with us from Scotland. Only about six months before moving here, I became really good friends with Sheila. Our daughters were in the Gaelic nursery together and had become best friends. Since we were constantly getting the kids together after nursery (along with Robyn and Laura and their daughters), Sheila and I got to know each other really well. And I loved her to death. She was one of those people you just automatically click with and after only a few weeks, I felt like I could trust her with anything. It was really hard having to leave her after only just getting to know each other, really hard. She came over for weeks prior to our move to help me clear out each room of my house, take trips to the dump, and clean. Before I moved, she gave me a gorgeous tartan handbag (the kind I'd been wanting ever since I first visited Scotland with TMI, unbeknownst to her) and this blue Scottish foods tea towel. Since moving, she's been the person I've kept in touch the most with, via cards and packages. Lolly and her daughter send each other drawings and little gifts all the time, and often we include a little something ourselves for each other. 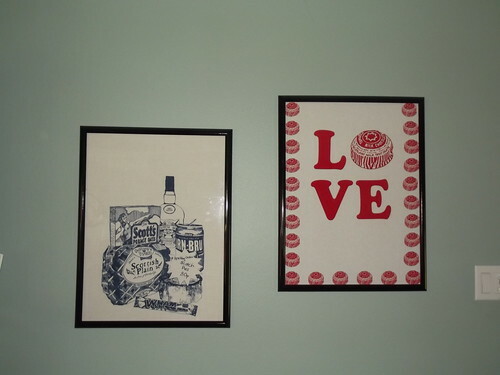 The red Tunnocks Tea Cake LOVE towel was one of the gifts she sent me. They are so adorable, I couldn't bear to use them, so I framed them. They are now in my living room. The next framed item is also a tea towel. This one came from Robyn, another nursery friend. Like I said, our daughters all loved to play together and were best friends. 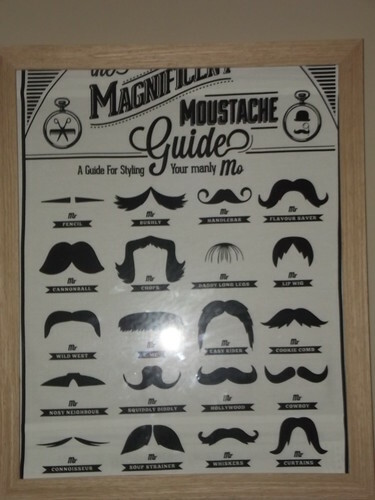 Robyn knows I have a thing for moustaches, and she sent this to me after I moved here. So technically it didn't come over with us, but it's classified as a special thing that reminds me of her whenever I see it. It too was too nice to be used, so I finally framed it and hung it in Jaguar's moustache room. Sorry about the flash, I didn't realize it had reflected so badly, but it's in Jaguar's room, and he's asleep, so no retakes tonight. FYI, regarding all the tea towels, they are of such odd dimensions, no standard frame fit perfectly, so there is about six inches missing of each from framed image. Oh well. Again, poor image, sorry. This is a painting I framed a while ago and have hanging in my living room. 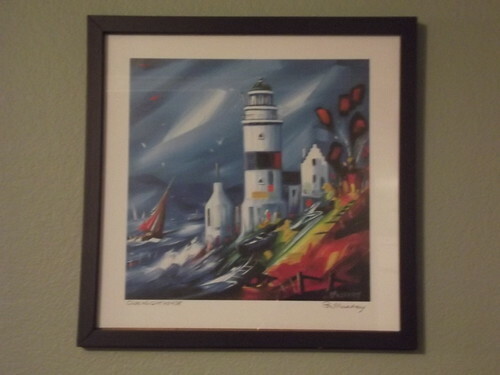 It's a painting of the Cloch Light House in Gourock, given to me and Fifi from my friend Debbie and her son who was in Fifi's class at school. I love it. I love all the things that remind me of Greenock (and Greenock friends). In the previous post about special things, I showed a picture of two little angels from Mollie and Rosie, girls I childminded. This little tile was from them too for Jaguar. It's a painting of the Waverly, which can be seen (and ridden) along the Clyde past Greenock. The tile hangs on Jaguar's wall next to his birthday banner. Also hanging in Jaguar's room, on the post of his bed, this little plaque was a gift from our friend from church Val when Jaguar was born. It was one of my favourite gifts. I was terrified it would break in the move, but thanks to about a meter of bubble wrap, it survived. Jaguar IS a real cute cookie, if you ask me! Moving out of Jaguar's room and into the kitchen, I have this glass painting by our friend Lorna. Lorna was one of the first people I met, though it took a few years for us to get really acquainted (it happened once I started going to her church), and there is literally no one I know on this planet with a bigger, more selfless heart. And when Lorna's around, there's going to be laughter. I don't know anyone else who has so many random, weird things happen to her, but if it's random and weird, it will happen to Lorna. I mean, do YOU know anyone who on more than one occasion has found a stray sheep wandering around her living room? Lorna used to invite the girls over for sleepovers at her house, and she always prepared really exciting adventures for them. Leaving Lorna was hard for all of us. The girls called her Auntie Lorna, because that's pretty much what she was. 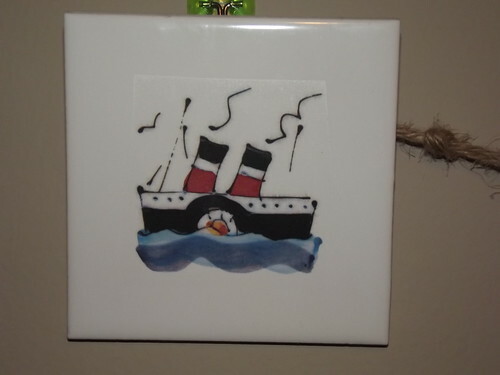 Lorna had started getting into glass painting, and before she moved, she gave us this treasure. 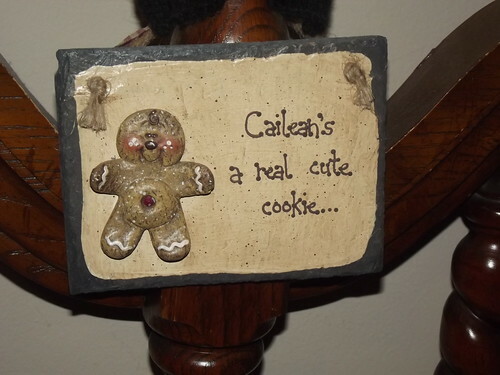 It hangs above the counter in our kitchen. 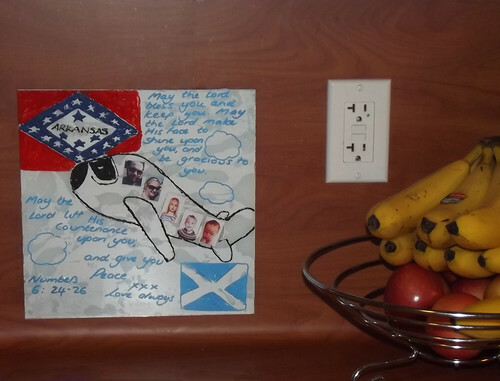 I love that she put in the effort of looking up the Arkansas state flag to add to the painting - along with the face magnets we used to have on our chores board that she glued to the airplane! Fifinally, the last photo, also in our kitchen, my green and white pottery bowls and a card in a frame. 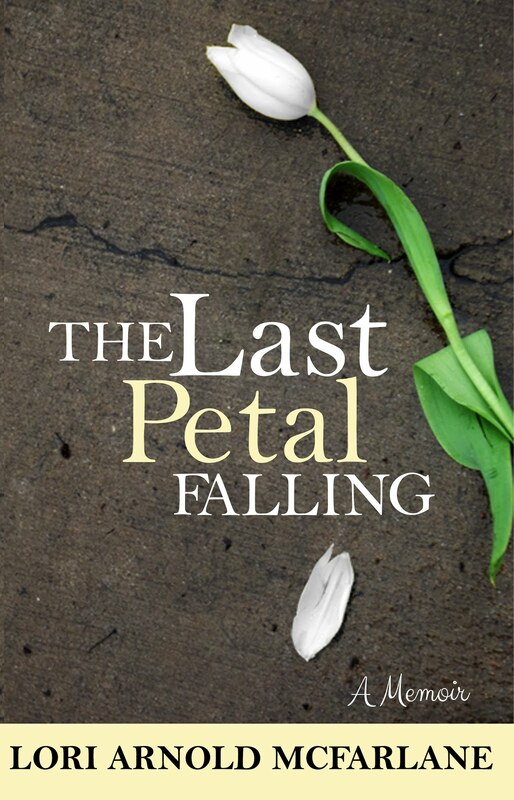 The card, which reads Children are the flowers of life was sent to us by my sister-in-law Rebekkah some time ago. I love homemade cards and usually keep them for a time, but this one was really beautiful. I loved it so much, it deserved to be framed. I found the white ornate frame which matched the ornate card so well, and put it in the girls' room in Scotland. It moved over with us and now decorates the top of my baking rack in the kitchen. The three stackable bowls are possibly my favourite things ever. These were made by my dear friend Maria's own hands in her pottery studio. They were among her first pieces she made, and according to her, they have flaws, but I see only beauty. She gave them to me as a going away present. I decorated my entire kitchen around them. I use them for special occasions only, and the rest of the time, they keep my kitchen pretty. There are some matching green candlesticks in the living room too, but I need to find a new place for them; my cat knocked one off the shelf the other day and broke it. A little superglue will fix it, but I don't to risk any more breakages. 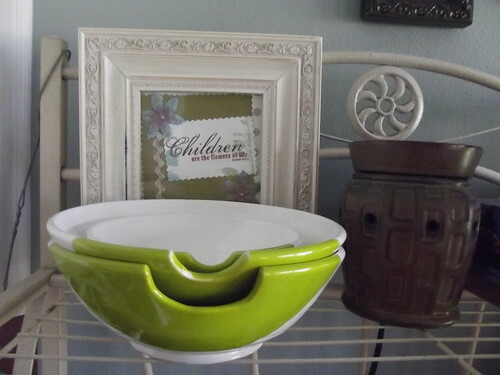 These three bowls make me so happy, and I love telling guests where they came from. They always get a mention. I love that Maria is so talented. I am really proud to be her friend. There are still a few other things scattered around the house, but most are in Fifi and Lolly's room, which I can't access right now (sleeping, yay! ), so a Part 3 is still to come!